Bavarian Wolframs-Eschenbach is a romantic small Bavarian town completely encircled by its town wall. Troubadour Wolfram von Eschenbach, writer of Parsifal, lived here. The Bavarian town Wolframs-Eschenbach is mostly visited to see its old town walls and to visit sights associated with German medieval troubadour Wolfram von Eschenbach, who lived here from 1170 to 1220. In 1917, to honor him, “Wolframs” was added to the town name by royal decree. Eschenbach’s history goes back to the mid-8th century but its golden age was the late Middle Ages when Eschenbach was half the size of Ansbach but twice the size of nearby Gunzenhausen. 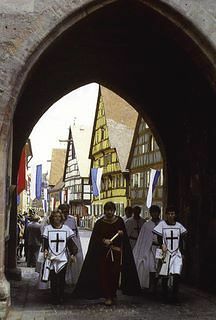 Its history was determined for six centuries by the Teutonic Order, which controlled the town up to the late 18th century. Wolframs-Eschenbach is a lovely small town of less than 3,000. The old town is fully encircled by its original defensive wall and worth the slight detour from the Altmühl Valley. Wolframs-Eschenbach, 20 km/12 miles south of Ansbach and 10 km/6 miles north of Gunzenhausen, is best reached by private transportation. Wolframs-Eschenbach Kultur- & Tourismusbüro, Wolfram-von-Eschenbach-Platz 1, 91639 Wolframs-Eschenbach, tel 09875-97-550. The main attraction of Wolframs-Eschenbach is its lovely old town. It is still fully enclosed by its original town wall, which is 1.5 km/a mile long and up to 4 m/13 ft high. It is possible to walk around the D-shaped town in around 20 minutes; crossing through its center can be done in five minutes from town gate to town gate. Wolframs-Eschenbach has been described as a miniature Rothenburg ob der Tauber and it is actually about the size Rothenburg was at the completion of its first wall. Most of the buildings of note in Wolframs-Eschenbach were erected by the Teutonic Order. The former Deutschordenschloss (Teutonic Order Palace), erected in a Renaissance style in 1623 is now used as the town hall. Also worth seeing is the Alte Vogtei (Governor’s Residence) and the Fürstengasthaus (Guest House). The most impressive mostly half-timbered buildings are in Wolframs-Eschenbach’s Hauptstraße. The Mariä Himmelfahrtkirche (Mary’s Assumption Church) in Wolframs-Eschenbach is partly from the 13th century and thus one of the oldest Gothic hall churches in Bavaria. It once had a Baroque interior similar to its Mary Chapel but it was removed during the late 19th century. According to legend, Wolfram von Eschenbach was buried here. 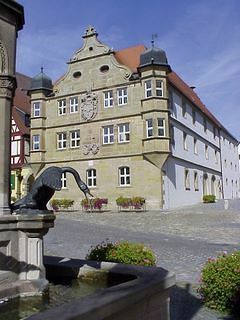 The Gothic Altes Rathaus (Old Town Hall) now houses the Museum Wolfram von Eschenbach, Wolfram-von-Eschenbach-Platz 9, tel 09875-975-534. It uses modern technology to explain the life and works of one of the most important German artists of the 12th and 13th centuries. The museum really is only of interest to German speakers with prior knowledge of both the author and his works. Opening hours are April to October from Monday to Sunday from 2 to 5 pm, Sundays additionally from 10:30 am to noon, and from November to March on weekends only from 1 to 4 pm. Admission is €2.